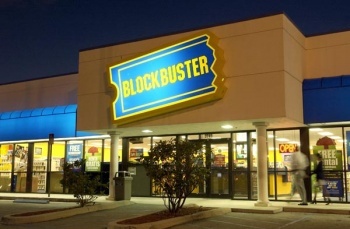 The once mighty video rental franchise Blockbuster will soon be nothing but a memory. I suppose it was inevitable and a long time coming but for those of us of a certain age, there's still a vague sadness to the news that Blockbuster is closing what's left of its doors. After years of struggling to stay afloat, parent company Dish announced today that the roughly 300 remaining retail Blockbuster outlets in the U.S., as well as the company's distribution centers, will be closed by early January 2014. The Blockbuster By Mail rental service will also be ended in mid-December. "This is not an easy decision, yet consumer demand is clearly moving to digital distribution of video entertainment," Dish president and CEO Joseph P. Clayton said in a statement. "Despite our closing of the physical distribution elements of the business, we continue to see value in the Blockbuster brand, and we expect to leverage that brand as we continue to expand our digital offerings." Blockbuster filed for Chapter 11 bankruptcy protection in 2010 and was acquired by Dish in 2011, but the era of Netflix meant its days were numbered. Within a year of the takeover, Dish began closing stores, but was unable to stop the bleeding. The plan now is to focus on the Blockbuster @Home service on the Dish Network and the Blockbuster On Demand streaming service.